Back in January the original members of the Memphis Area Modern Quilt Guild started to collaborate and conspire against one of our own. 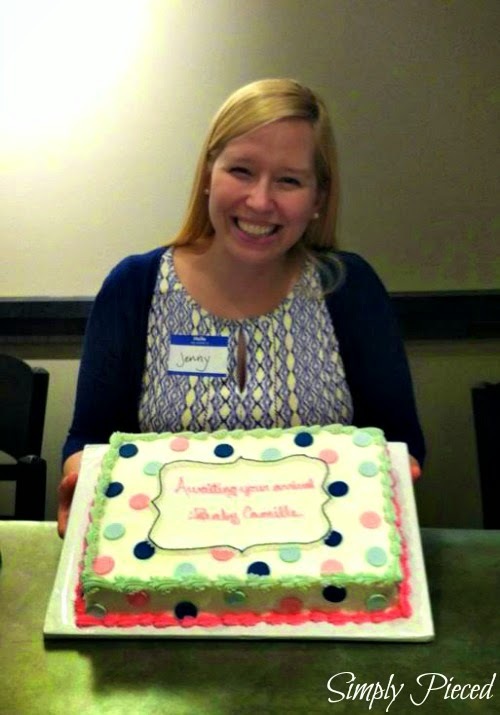 Jenny, one of our members, is expecting her first baby very soon, and we just couldn't let the event pass by without celebrating it. Our February meeting just so happened to be at Jenny's house, and we took the opportunity to ask her all kinds of typical questions. The most important question asked that would interest a quilter in particular is about the nursery colors (navy, white, gray, and pink). Once we had collected our much needed info, we choose our block pattern (a star block), we decided on where to showcase the nursery colors in the quilt, and we had one month to finish two star blocks before the next meeting. The March meeting was entertaining with all the block hand-offs. We were trying not to bring attention to ourselves, but I'm sure some of our new members could tell something was up. One of the contributors offered to donate batting for the quilt. We sat outside of a restaurant for two hours after our meeting chatting with Jenny about anything and everything. Little did she know that we were waiting for her to leave so the batting could be handed off. 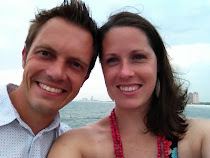 The one person we didn't want to notice seemed to be completely oblivious to our scheming, so we were in good shape. With all the blocks in hand, I got busy piecing the front, piecing the back, basting, quilting, and binding. I had 4 weeks to finish this quilt. That's not usually a bit deal for me, but I was also working on a queen size custom order at the same time. It all worked out in the end and the quilt was completed in time. The April meeting was a rush. Jenny, who habitually shows up late to our meetings, was actually early! We had to work around it and still act like nothing was going on. We had a cake hidden under pizza boxes. The quilt was finished except for the writing on the quilt label. Jenny almost walked in on that one. We incorporated her quilt into our show and tell during the meeting. One of our members held it up and Jenny's immediate reaction was, "Awwww!" She still didn't know it was hers. We asked her to go up and stand by the quilt and then it all clicked. It was a successful surprise. We had a lot of fun putting everything together and honoring one of our beloved guild members. I love collaboration quilts. It's so fun to work together. Congratulations to the new mama! 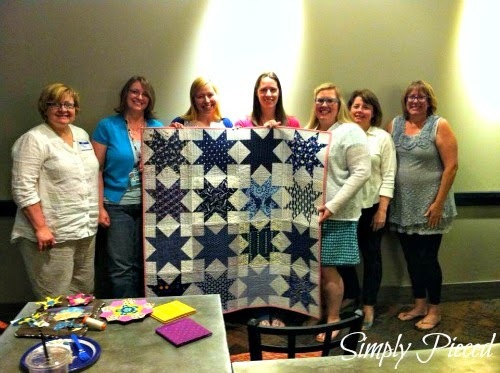 Congratulations to Jenny.The quilt is fabulous,her big smile is the win! 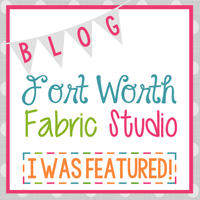 Aw, what a great story for a great quilt! Jenny is very lucky to have such a great group of friends and guild members! What a great idea and collaborative effort! It turned out to be awesome! Thanks for taking the lead on this Janet! It was fun and jenny sure was surprised! What a sweet and thoughtful gift to create for a guild member! And what a great job of pulling it off without her figuring it out! Love the fabrics everyone chose! And the pink binding is perfect with the stars and the backing. I'm sure she'll always treasure it. 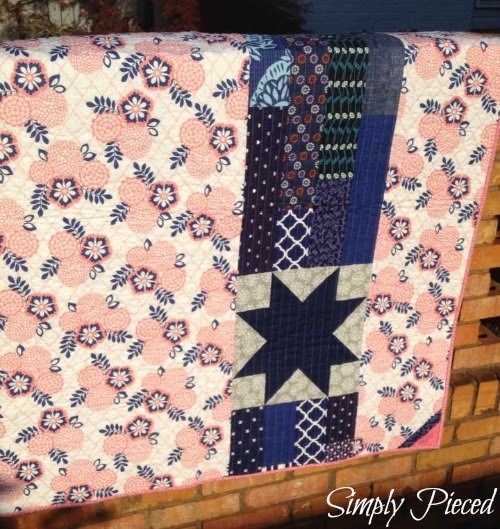 Secret quilts can be so much fun - the quilt looks great! Best wishes to Jenny for the new arrival! It was so much fun surprising her! I love that quilt. Her colors are so much fun (and my favorites). Thank you for organizing and putting it all together for us! The binding and the backing are so fun! 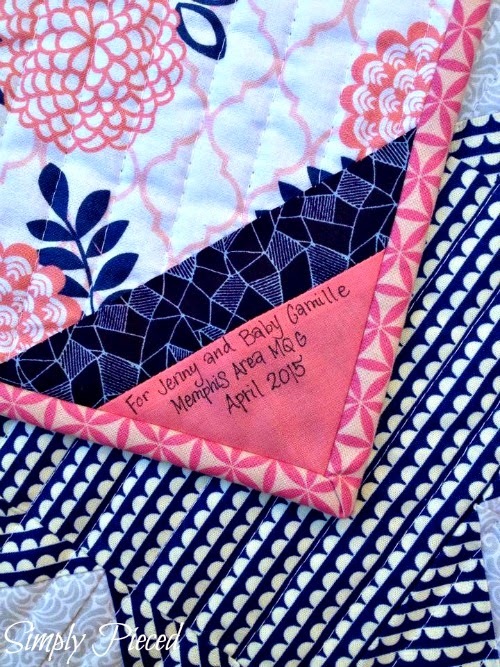 The quilt is so pretty; what a wonderful gift. I'm sure Jenny will treasure it always! It's so pretty!!! Great job! Love the stars! Such a lovely gift. 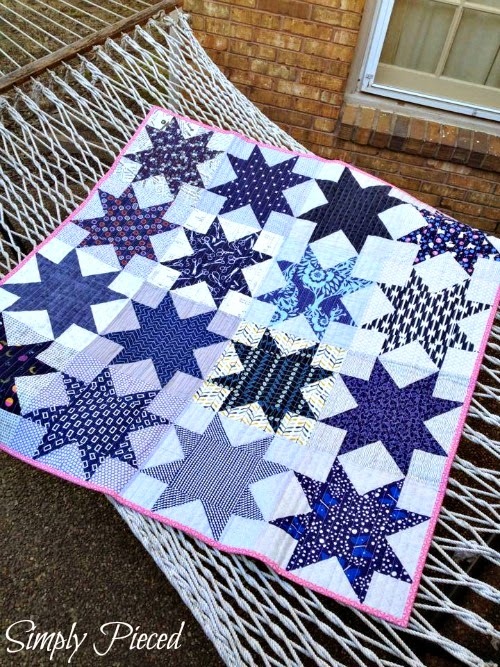 Love the star with the mixed up blues! Beautiful effect - Beautiful Quilt!!! I love all those stars! Gorgeous! And what a fun way to surprise her with a fantastic gift.